September has arrived, ushering in the end of summer and the beginning of fall. The kids are finally back in school, asking questions and learning answers, but questions aren’t just for the kids. They can be for HR too! Here at ApplicantPro, we are finishing reading a book all about questions. During the month of August, we read A More Beautiful Question by Warren Berger. Our founder and CEO, Ryan Kohler, asked us as a company to read this book so that we may “build a foundation of being good at asking questions to clearly define the problem that we are trying to solve.” This is just the beginning of an exercise ApplicantPro will undergo to improve not only the company and our services, but also our own lives by asking better questions. We aren’t the only ones who can benefit from asking questions. Questions are for everyone: young and old, (if you have a four-year-old, more than likely “Why?” is a popular subject in your house) students and businesses, management and employees, alike. They are especially important for HR. 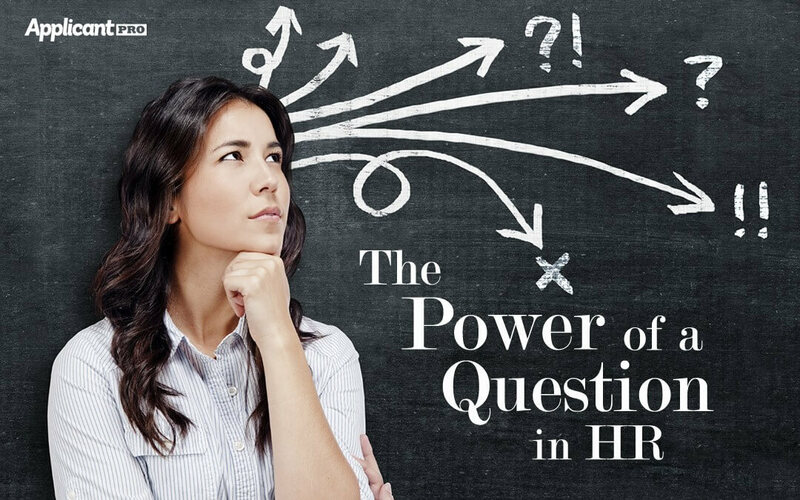 Here are four reasons why HR should implement more questions in their hiring processes. Too often in the business world, asking questions is perceived as a bad thing. Berger acknowledges this issue, stating that the “business world has a . . . love/hate relationship with questioning.” A question is too easily perceived as a challenge—mostly to the norm and how things have been run for, well, years. Questioning can be disconcerting! But when we talk about questioning in the business sector, we don’t mean changing the norm or challenging your superiors. It’s much more simple than that. Asking a question can be beneficial to you, your position, and the company as a whole. Questions ultimately bring about change, but it doesn’t have to be big and it doesn’t have to be bad. Change can be as simple as getting you a seat at the table and the things you need to perform your job, like an applicant tracking system that will streamline your hiring process and make your job a breeze. The hardest part is actually asking. Once you know what you need, ask for it! Think of the best question(s) to ask your employer that will make him or her want to help you solve the problem as well. Asking for what you need is as simple as one question. Getting what you need depends on that one question. Make it count! When faced with a problem, the first thing you will want to do is solve it. But there are different stages of the solving process you’ll want to use in order to find the best solution to your problem. Berger outlines this process in his book, describing it as a progression “from becoming aware of and understanding the problem, to thinking of possible solutions, to trying to enact those solutions.” These stages are better defined as Why, What If, and How. Why – Start with your “why” questions. This is where you dig deep and get to the bottom of the problem. Uncover the reason behind the problem by asking the “why” questions that will get you there. The sole purpose of asking “why” is to get you to see and understand the problem. There’s a reason your four-year-old asks you “why” all the time. Children want to know and understand the world they live in and why things are the way they are. The same applies for trying to solve a problem. Ask why! Once you understand the root of the problem you can move on to the next step. How – The third and final step is all about action. Ask the action questions that will get you to actually solve the problem. Commit to an idea and work on the questions that will lead to the best solution. In this stage, “narrow possibilities and converge on the one [idea] deemed worthy of being taken to the next level.” Keep in mind, however, that this step will not always result in the correct solution the first try. More often than not, after going through this process, the solution fails. Try again! Questioning is an on-going and never-ending process. It’s important to note that the answer isn’t what your focus should be on. It’s the question. We are so often focused on finding the answers that we don’t give enough thought to the questions we’re asking. Berger argues it isn’t about the answer—it’s about the question, “The best innovators are able to live with not having the answer right away because they’re focused on just trying to get to the next question.” We get so caught up in finding the right and best answers to our questions, we don’t realize that the problem itself lies in the question. "People spend less than 10% to 20% of their time looking at the problem, because they are so eager to jump into solving mode. We should be spending 80% of our time clearly understanding the problem, who it impacts, how it impacts them, and ensuring that we are trying to fix the real disease and not just a symptom. Luckily, defining a problem is actually pretty easy, it is just a matter of having the discipline to not jump into solving mode before you spend enough time to get a really solid understanding of the problem." The same applies to HR. It’s too easy to jump to conclusions about the next perfect hire or finding the right online hiring system, like ApplicantPro. Follow the Why, What-If and How process, starting with Why do I need to improve my hiring process? Why is this system better than the next? Or, Why is this the perfect candidate for the position? Why is this candidate better than the rest? Why is the applicant with an education more experienced than one without? In order to get a better answer, ask better questions. Get down to the fundamentals and you’ll be generating questions with billions of potential answers and more ways to solve the problems you are facing. Questioning gets your business moving again. It generates new thoughts, ideas and possibilities to change processes. Though change can be scary, it’s going to happen whether we like it or not. If HR wants to “survive” like the Fast Company article says, questioning will be a big step to “save” it. Start by asking questions. Like, Why does HR need to change? What if HR gets a seat at the table? How does HR improve its business strategy? How does HR improve its hiring process? These are all questions with open-ended answers (answers that don’t necessarily need answering) but have many potential answers that could benefit your company in the long-run. Keep working towards the next question and foster growth and innovation in your HR department and your company. Hiring someone who can ask good questions is ultimately someone who is going to help your company grow. Recognize the difference between someone asking bad questions and good questions. Recommend to your hiring managers to take a special interest in individuals who ask good questions during the hiring process, especially those questions that lie in the same direction your company wants to go. A good questioner can be a great addition for your company and foster the growth and innovation it needs to succeed in a changing world. Indeed, you can hire the questioners, but you can also cultivate new questioners with your current employees. Here at ApplicantPro, we started with A More Beautiful Question and held questioning activities during company meetings. We will continue to implement more ways to ask questions, as well as learn how to ask better ones, and use them to make our company and our personal lives better. Your company, your department or you personally can do the same! There is great power that comes in asking questions. Questions only lead to better solutions—and more questions. The process never ends. Don’t be afraid to ask! The people who are asking questions are the ones who will change the world. Overloaded with questions? The answers to your hiring problems start here.